Jamestown LP's Innovation and Design Building in Boston is the latest development to provide URB-Es as an amenity for its tenants! The Innovation and Design Building is a creative office workspace adjacent to Boston Harbor where the best of Boston's minds come to work. IDB offices and workspaces are state-of-the-art, and its location is steeped in history. The building itself was constructed in 1918 by the US Department of Defense, and it served as an army and navy warehouse during WWII. Today, the Innovation and Design Building’s airy rooms house companies and innovators spanning a wide range of sectors. The building aims to “attract industries that are pioneering the innovation economy” by providing versatile, open-air workspaces and cutting-edge amenities. One of those cutting-edge amenities, of course, is URB-E: the world's most innovative foldable electric scooter. Jamestown LP purchased IDB branded URB-Es to provide sustainable workday transportation options for their tenants. IDB tenants can check out URB-Es and use them to reach nearly any part of the city, from South End to Back Bay, Downtown, Beacon Hill and Cambridge. On URB-E, tenants avoid Boston traffic without breaking a sweat. URB-E extends the radius of possibility for lunch meetings, errands, and workday excursions of all types. URB-E partnered with Jamestown to launch the Innovation and Design Building's URB-E program at their Summer Kickoff Dock Party. 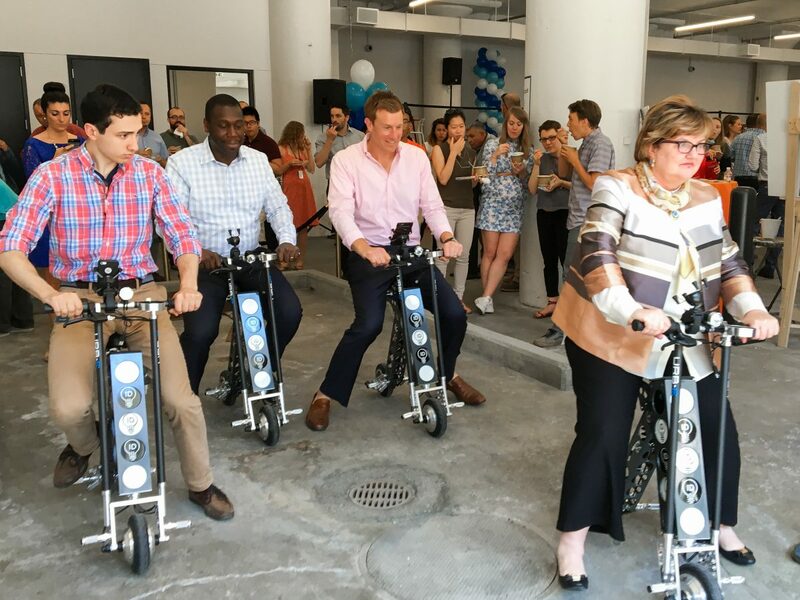 IDB tenants gathered at the building’s new loading docks for an afternoon of food, music, and URB-E test rides. The URB-E team even showed up to give custom tutorials at the event! Questions about URB-E’s partnership with Jamestown? Interested in setting up an URB-E demo at your office space? Call us at or email support@urban626.com.